1. Sand the surface of the item to be whitewashed with a fine sanding block, or an orbital sander with a super-fine sanding pad. 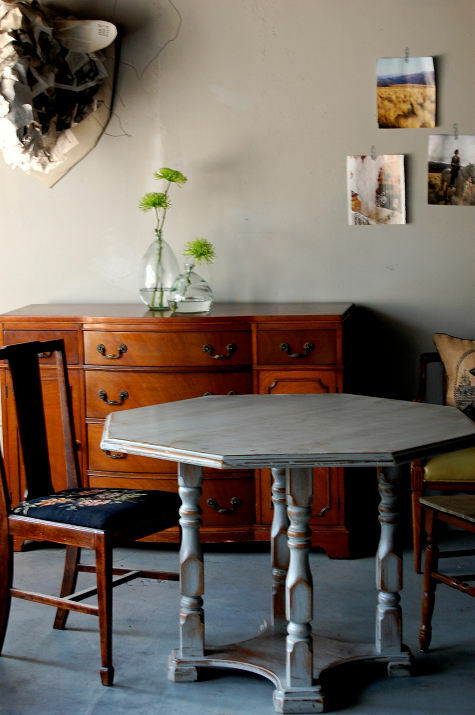 Once sanding is complete, clean the surface with a dry cloth to remove any dust. 2. Make your whitewash mixture. 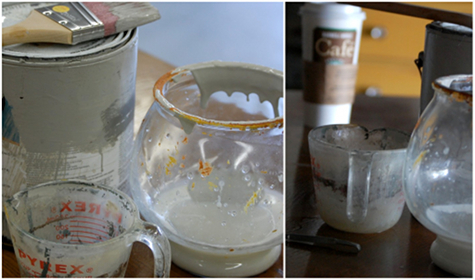 Mix two parts white or light gray latex paint and one part water. There are also white stains available at your local hardware store if you would like to take the guess work out of it, but where’s the fun in that!? 3. 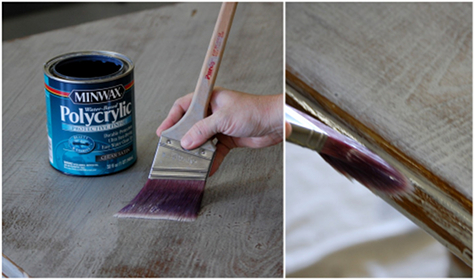 Using a paint brush, apply the whitewash mixture in long strokes following the wood grain. Whitewash tends to dry quickly, so work in small sections. 4. 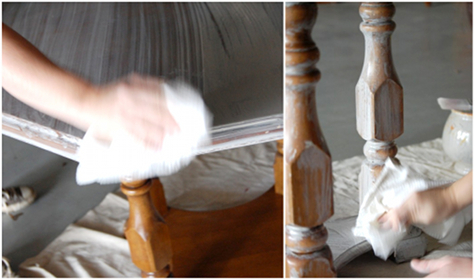 While the whitewash is still damp, wipe off excess with a clean rag. This will allow even more of the wood grain to show through in your design. 5. Allow the piece to dry completely and then repeat steps 3 and 4 until you’ve reached a desired level of coverage. This can be different for each individual! Allow your creative eye to tell you when enough is enough. 6. After the piece is completely dry, you can sand again to allow more of the wood grain to show through, or to just even out areas that have gathered too much paint. 7. 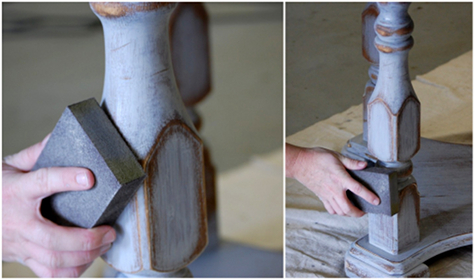 Seal the piece with a water-based poly applied in long , even strokes. Water-based poly is best for this surface because it’s white. 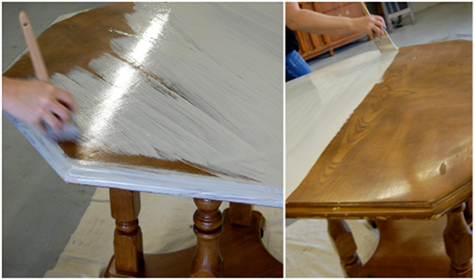 Oil-based poly will add a yellow hint, and take away from that fresh white glow! 8. Stand back, admire the goodness and give yourself a pat on the back for a job well done! ← Sangria! Treat yourself this weekend! your table looks fabulous! great job. Thank you very much, We enjoyed your article about the average Joe writing a “how to diet” book, something like that would generate much better than these fitness nuts! hey there and thank you for your info – I’ve certainly picked up something new from right here. I did however expertise some technical points using this web site, as I experienced to reload the website a lot of times previous to I could get it to load correctly. I had been wondering if your web hosting is OK? Not that I am complaining, but sluggish loading instances times will often affect your placement in google and can damage your high quality score if ads and marketing with Adwords. Well I am adding this RSS to my email and could look out for a lot more of your respective fascinating content. Make sure you update this again very soon. Thank you for your interest we appreciate it! And will be sure to update it! In regards to web hosting, we will look further into the sites problems and try to swiftly rectify any sluggish bugs creating a loading problem!